Quietly sophisticated theme for an accessible webshop that creates a special online shopping experience. Quickly add new products and enjoy instant showcasing on your frontpage thanks to the exemplary modules provided by GavickPro, like News Show Pro. With support for both K2Store and Virtuemart, you have multiple choices for building your business your way. 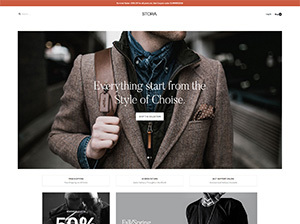 If your online store needs a sophisticated backdrop, you can’t go wrong with this stylish ecommerce template for Joomla. Elegant design concepts lead to a modern, fashionable look to dazzle your clients. With VirtueMart and K2Store support, this online shop theme carries multiple commercial choices for managing your products, and on the promotional side of things, our product-display module produces large, eye-catching showcases based on your chosen categories, and also brings your blog articles and news to the frontpage in majestic image and text overlays that exhibit refined style. Header slider modules deliver big sales and news to your visitors. With the use of our Image Show module, a restrained header slideshow provides the perfect place to promote your new collections or sales. Slides can be added, overlay text changed and updated in mere seconds. Your customers will appreciate being kept in the loop and taking advantage of your great offers! Shop & Buy includes Ajax Cart implementation, which allows for real-time cart updates without reloading the page. Customers can browse, inspect, and buy all within a few clicks, no waiting required. Plus thanks to our optimization, your site will load quicker for faster purchases. Finally, multiple options for customization, including support for Google and Squirrel fonts, predefined color schemes and more, let you add your personal touch to this amazing shop template.